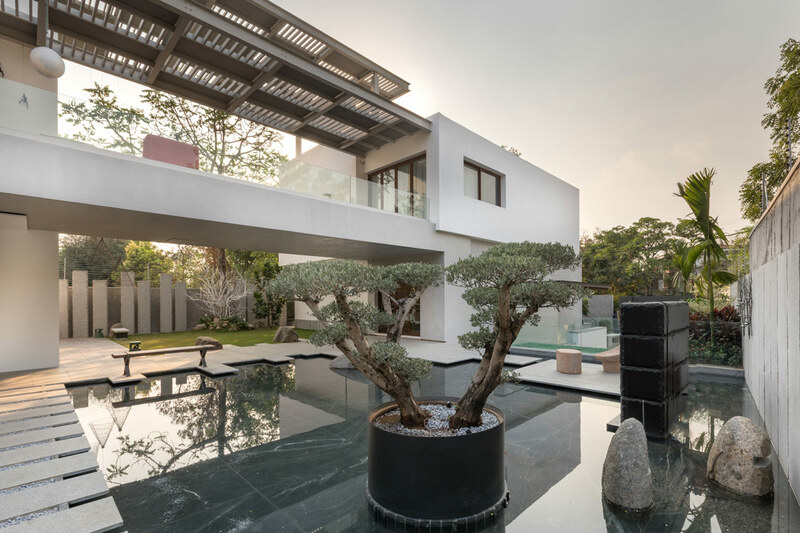 These two stunning modern Indian villas, created by architect Moriq, each feature peaceful courtyard designs within them. 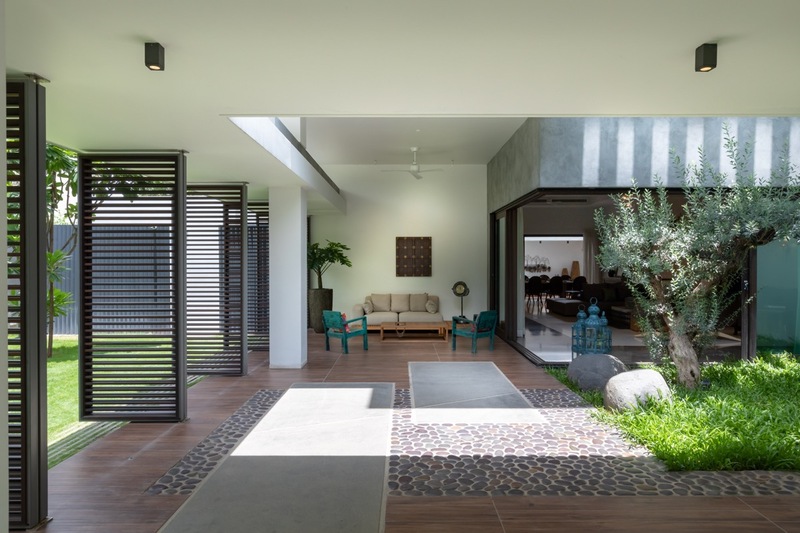 One has a combination of green space and a multi textured floor, which acts as a border of privacy between the entryway to the home and the main family living area. 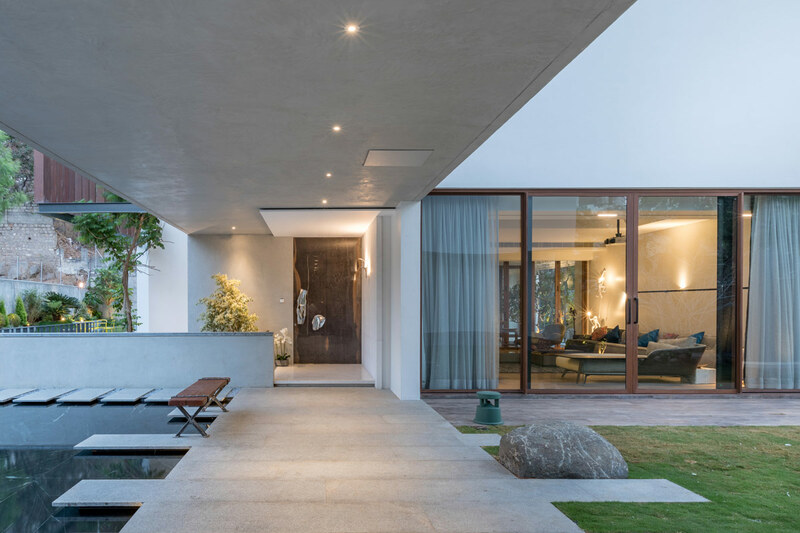 The second features a pivotal water body that greets the family when they come home, and welcomes in guests. 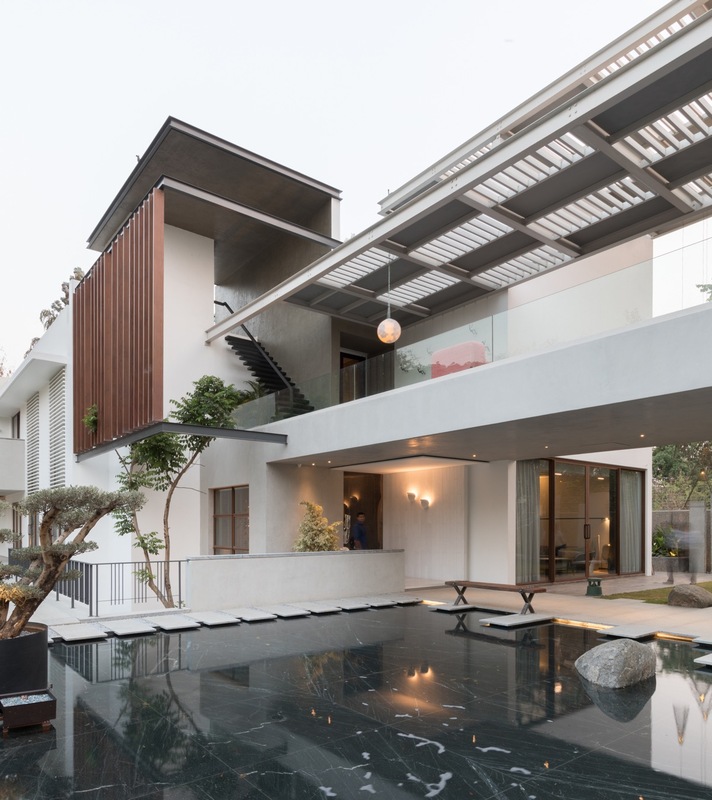 A connective bridge between living volumes on the the first floor overlooks the reflection pool and lawn, and a projector screen that provides outdoor entertainment. 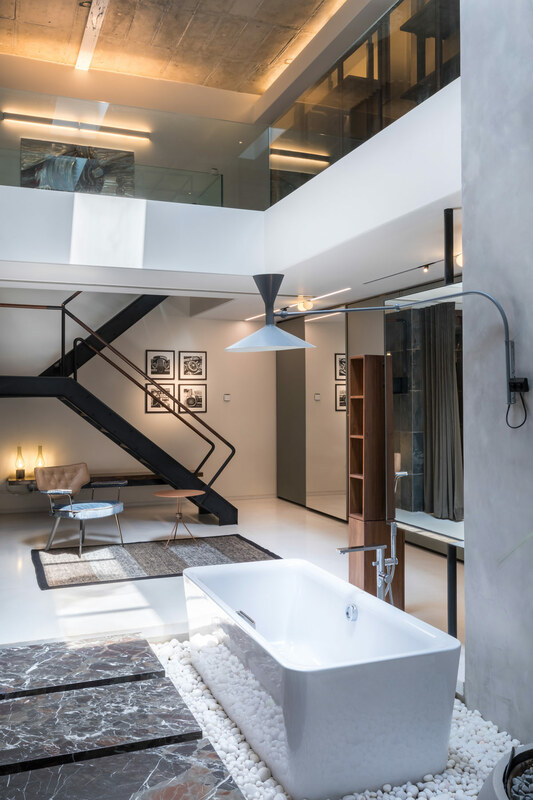 The two tours also feature impressive interior spaces that are steeped in contemporary elegant luxury. 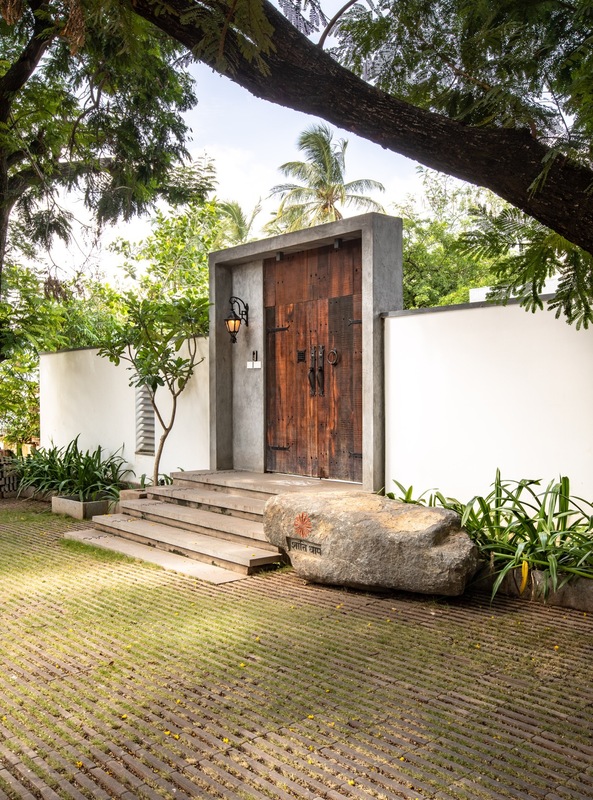 Villa number one is located in Hyderabad, with an area of 7500 square feet. 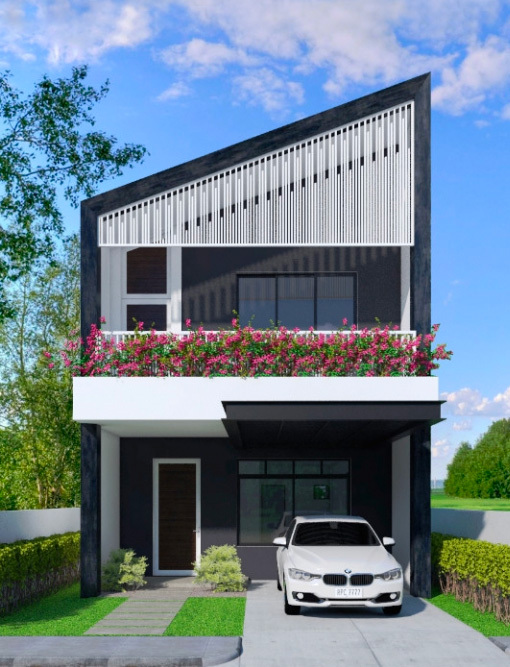 The build follows the traditional Hindu Vastu shastra system of architecture, and has been fashioned to fit a single family. The linear north facing plot has an open plot to the south; neighbours are at home on the east & west sides. 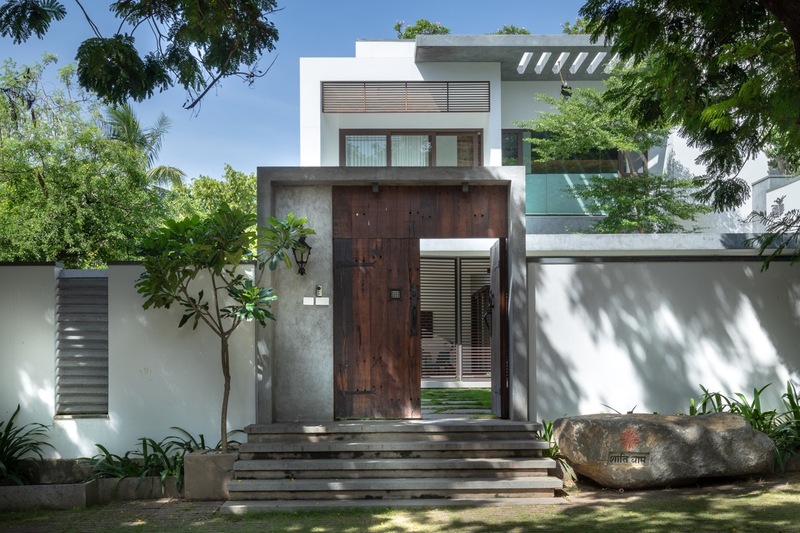 A simple white concrete modern home exterior guards the hidden luxuries within. Just outside of the front gate, there is a boulder with the name of the house upon it, written in Hindi. The name given to the house is ‘Shanti Dham’, meaning ‘a peaceful holy place’. 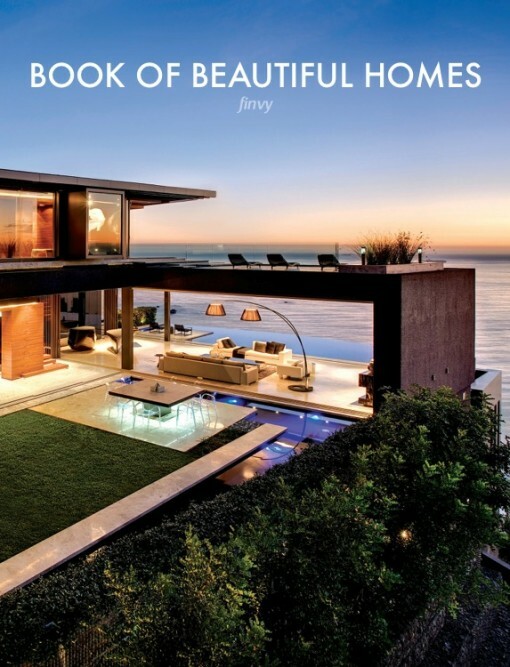 Once beyond the gates it is clear to see why the home is thought a peaceful and holy place for the homeowners. 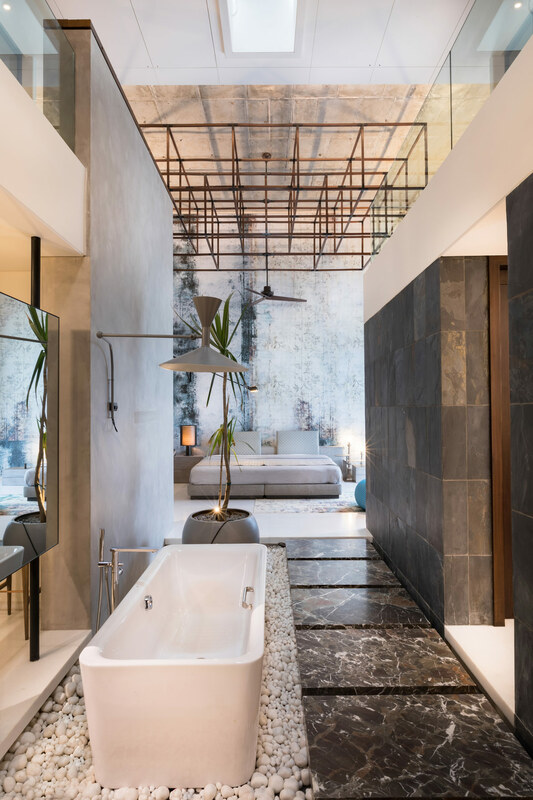 A combination of simplicity and understated luxury shapes the home, and allows the family to remain grounded and be close to nature. It is a direct translation of the personality of the well travelled and elegant couple. 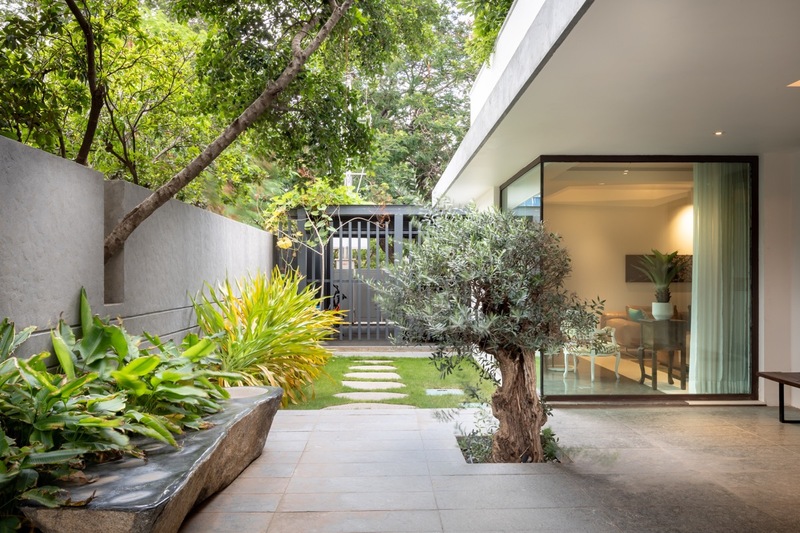 A tree from the neighbour’s compound has been integrated into the landscape design. 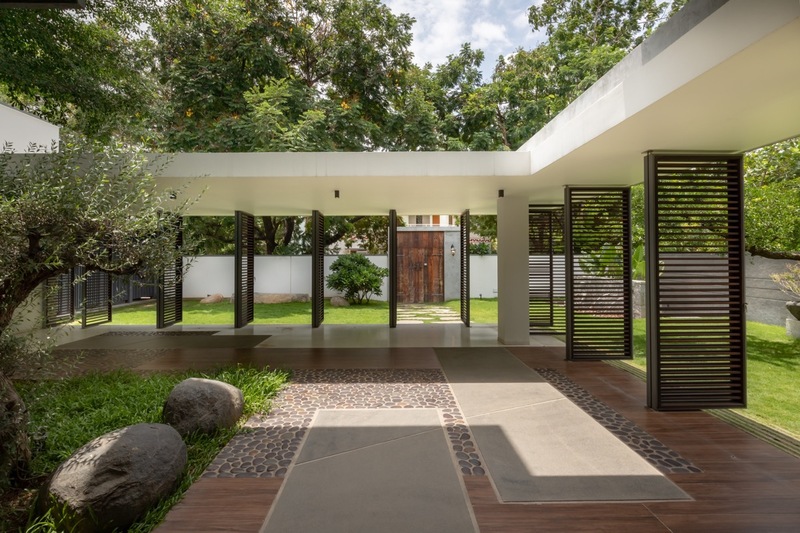 The main feature of the home is the modern courtyard design that lies between the front yard and the living room. 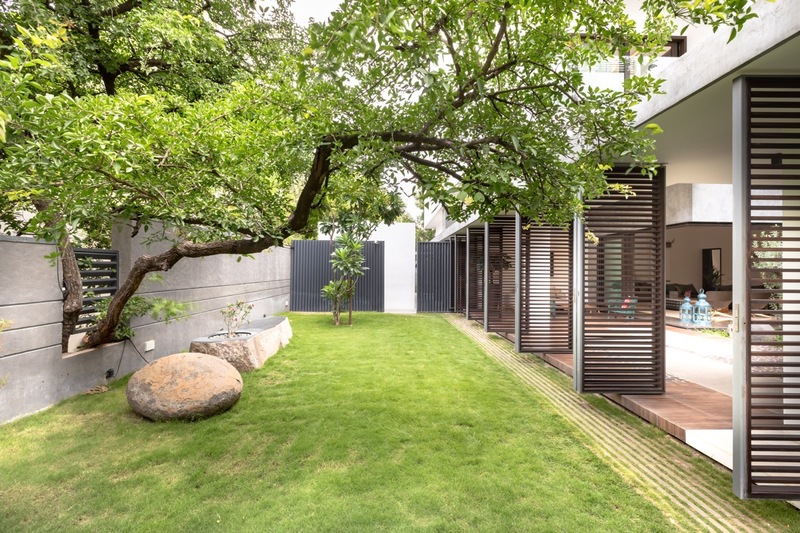 Because this is a north facing plot by vaastu principles, the living space had to be placed to the north east side. 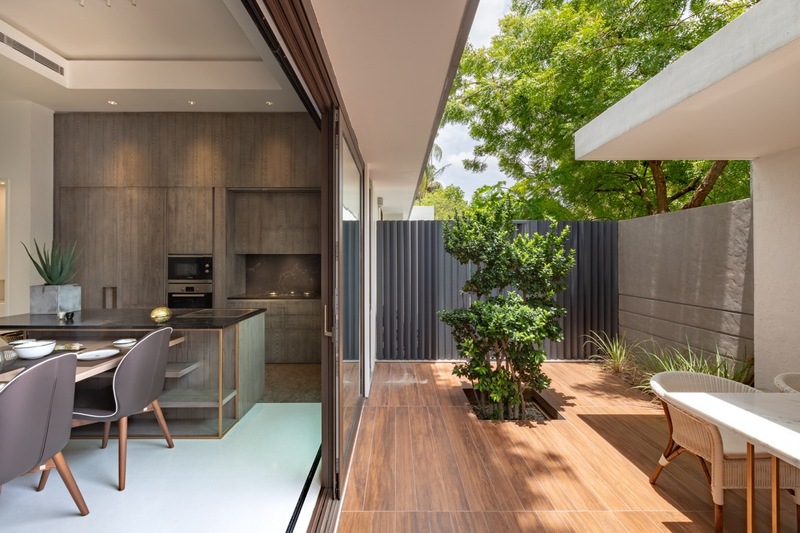 Any entry from the north east side would encroach on the family’s privacy, so the interior courtyard between the front garden and the lounge was introduced as a buffer zone. 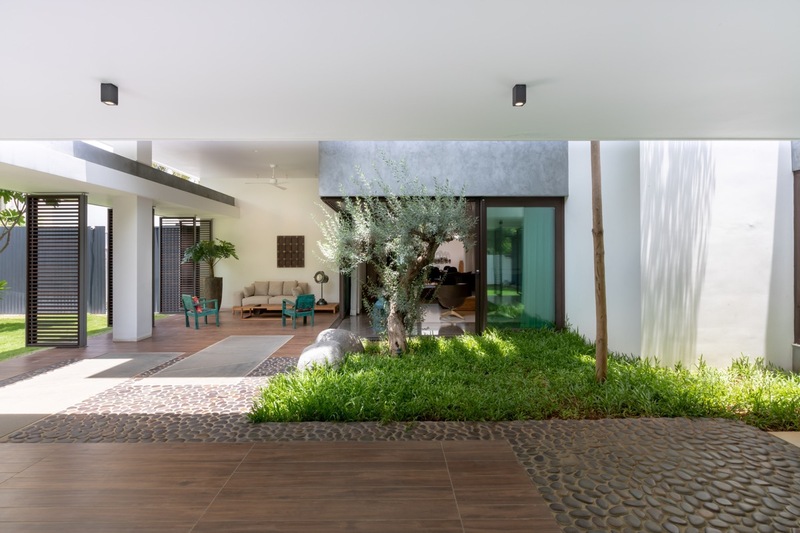 The courtyard design imitates the natural landscaping that surrounds the home. 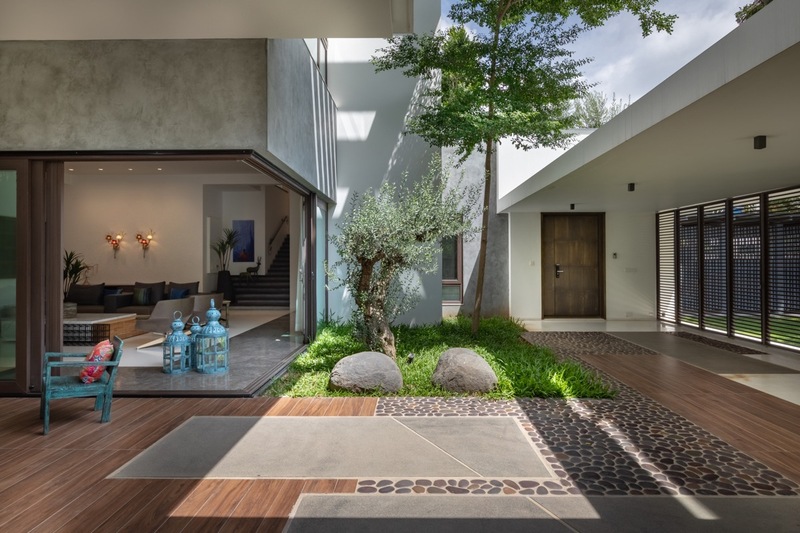 The courtyard floor is made up from interlocking sections of wood effect tiles. 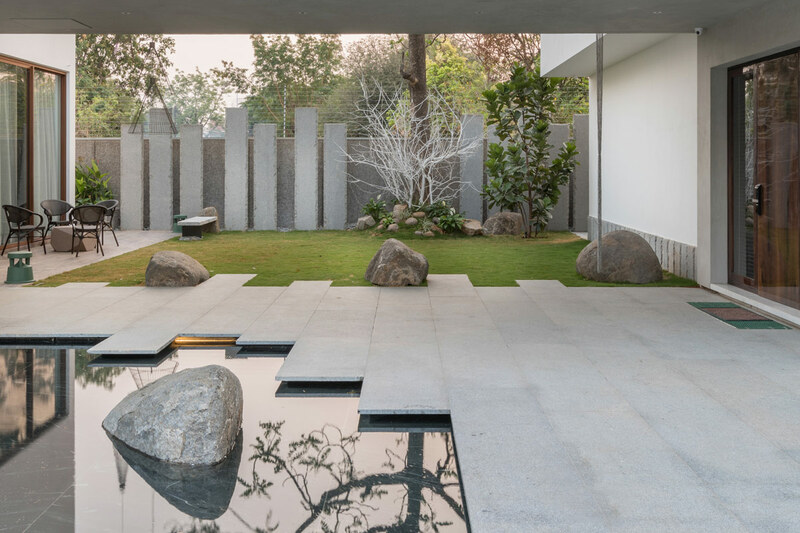 white marble slabs, pebbles and natural stones from Pondicherry. 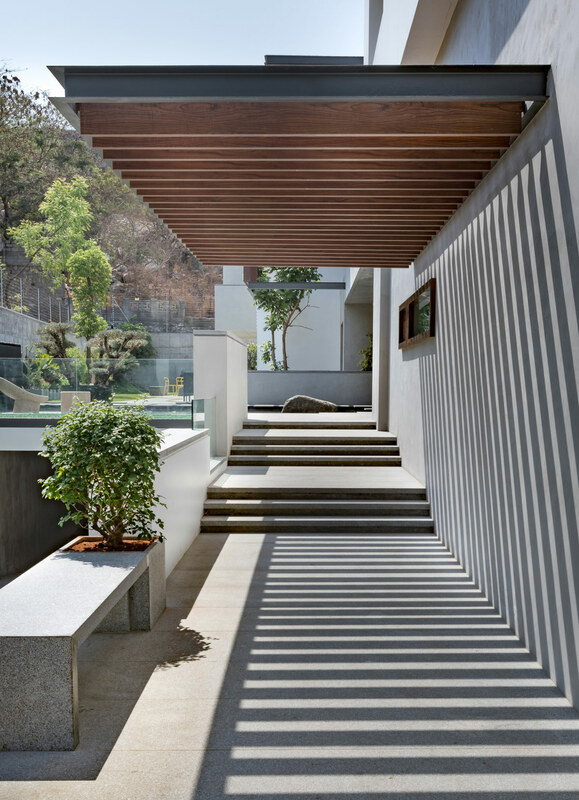 Custom louver doors make up the boundary, composed from MS frame and natural wood. 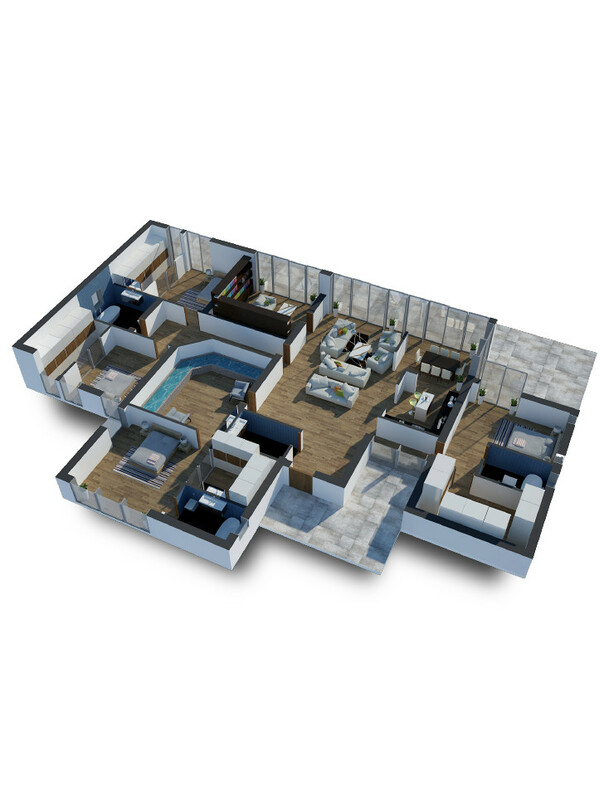 The ground floor consists of a dining room, a dry and wet kitchen with utility and storage space, and one of the bedrooms with an attached deck area. Mature trees have been retained in every part of the natural space. An outdoor dining space is available for use just outside of the interior kitchen diner. 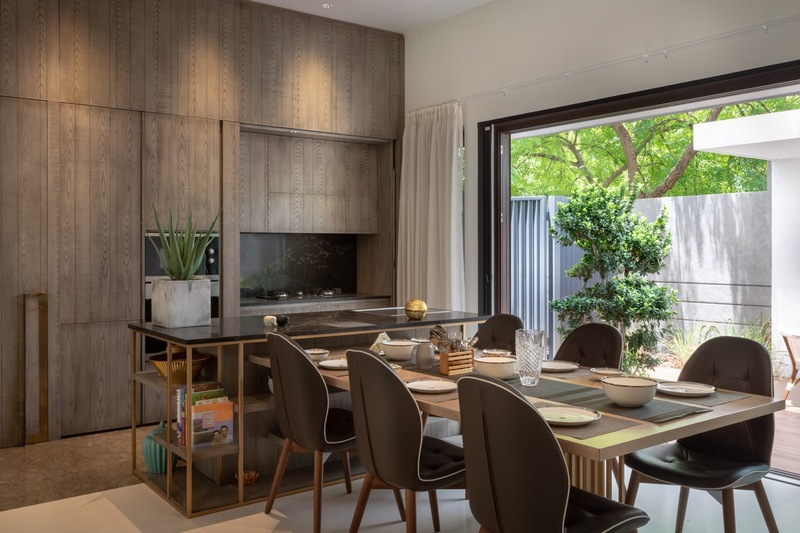 The modern dining room extension runs straight off of the kitchen island. 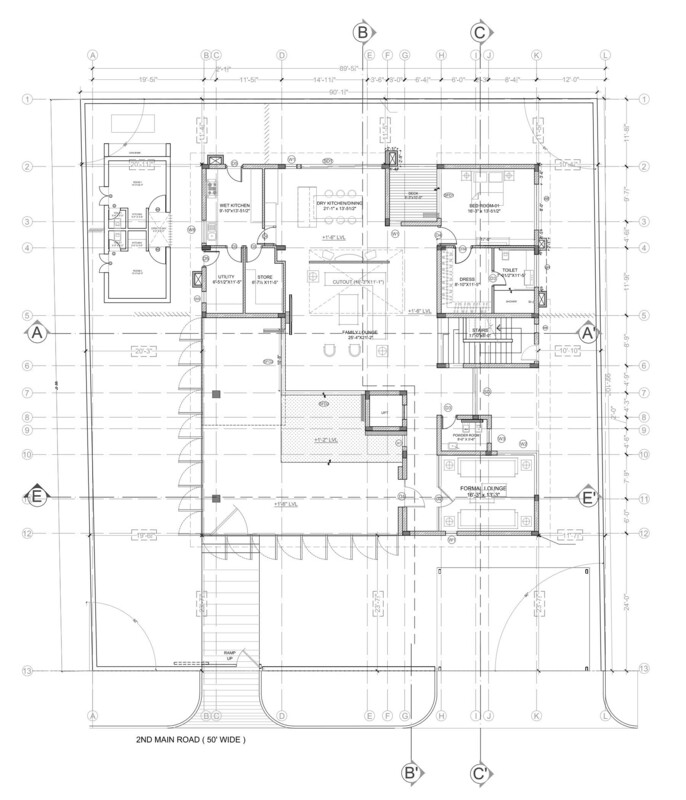 First floor layout, including a living area, three bedrooms, a study with balcony, and a puja room for worship. 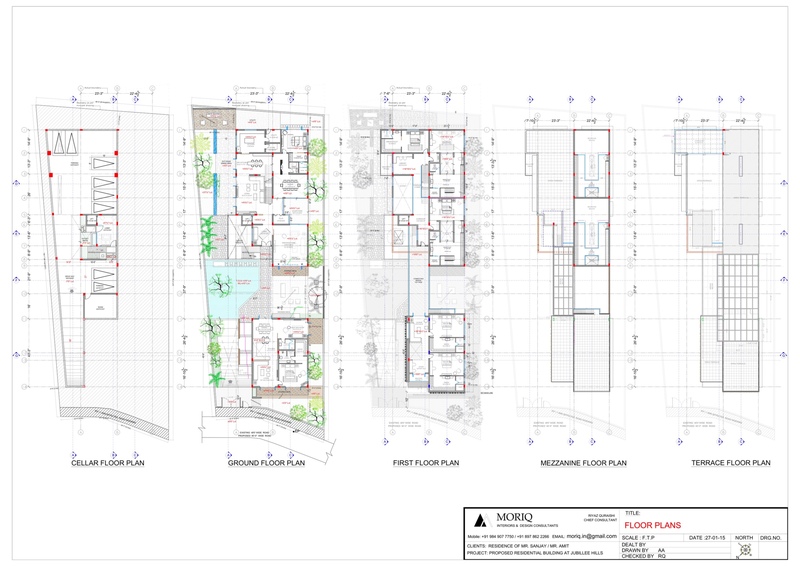 Second floor layout, including a home theatre, gym, lift lobby, powder room and a generous open terrace. 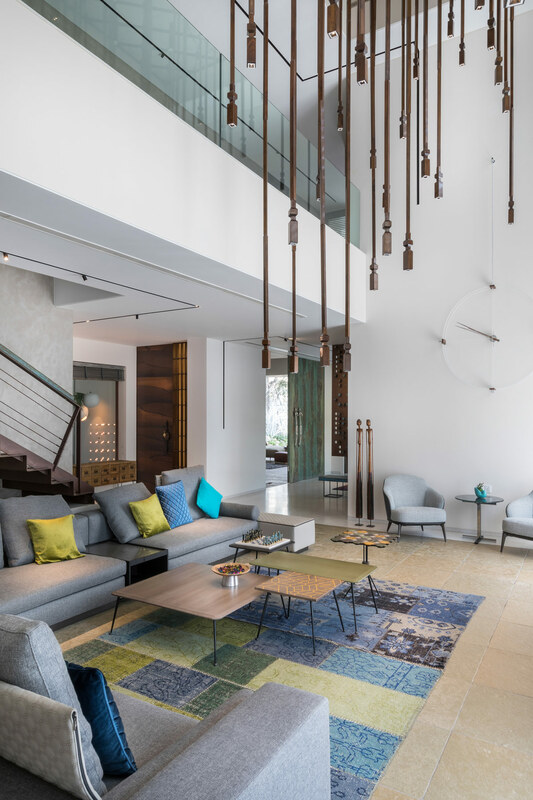 Our second tour also takes place in Hyderabad, this time in a home with a total area of 17006 square feet. 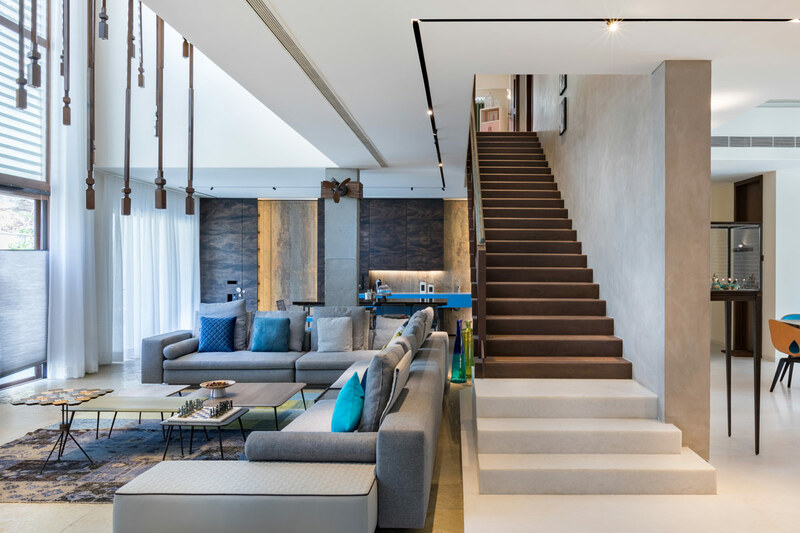 The massive plot facilitates a home design that brings together a large joint family, whilst still providing each member with their own personal space. 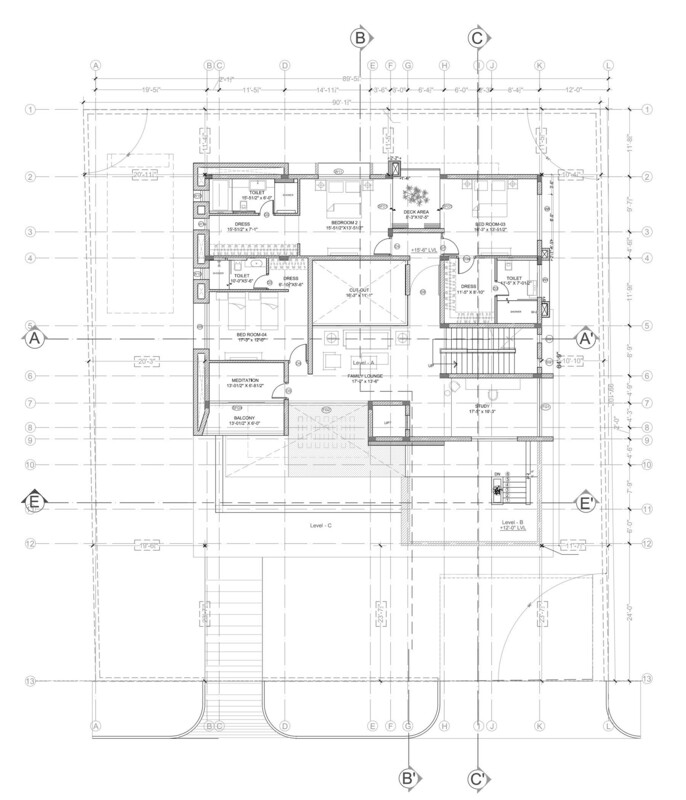 The most challenging part of the planning stage for the family was to come up with a solution that would best use the large linear shape of the plot. 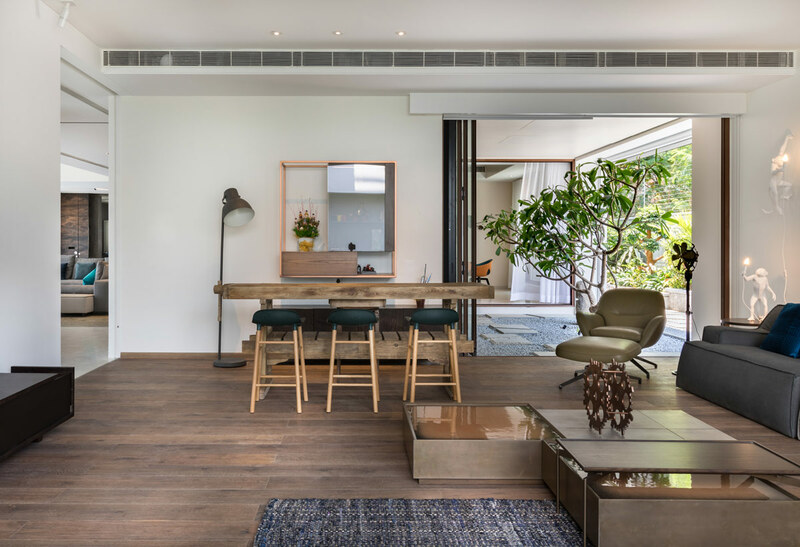 In the end, the first quarter of the plot was allocated to the family elders who requested an independent studio apartment so that they could have a space of their own. A reflection pool fills the connective exterior space, along with green landscaping. The beautiful vista welcomes you to the family home. 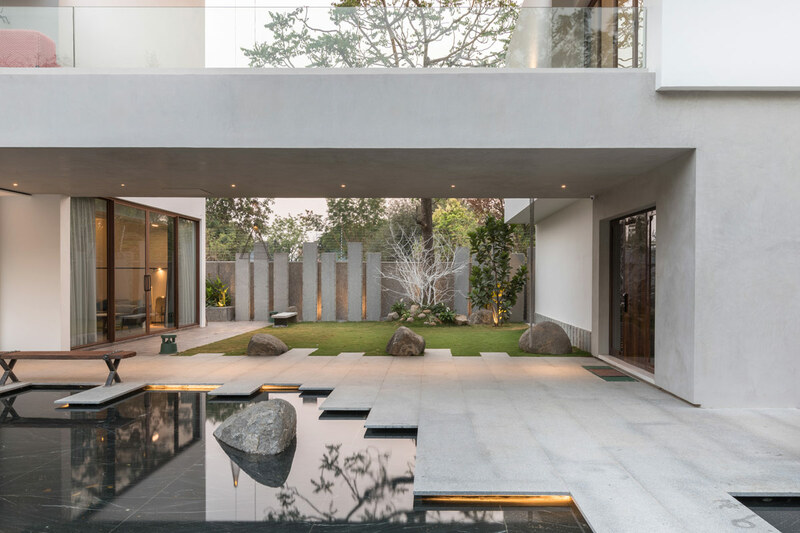 Concrete slabs are arranged in an irregular design in the water filled courtyard. 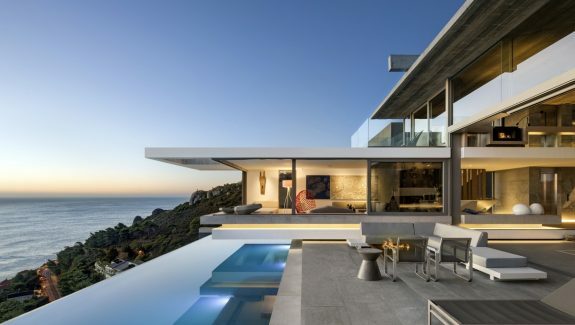 The patio is lit around the edges to accentuate its jagged shape. Boulders jut out of the still waters, and create a border around a lush lawn. Brothers live with their families right across the lawn from each other. 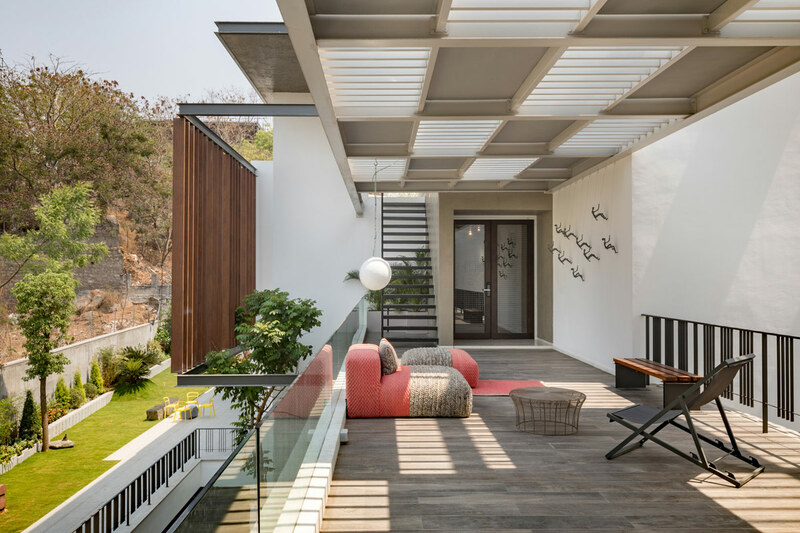 A semi-formal living room, complete with a bar, opens onto the lawn to create a prime social gathering spot. There is also a projector here that converts the lawn’s wall into a large screen – perfect for parties and the IPL cricket season. 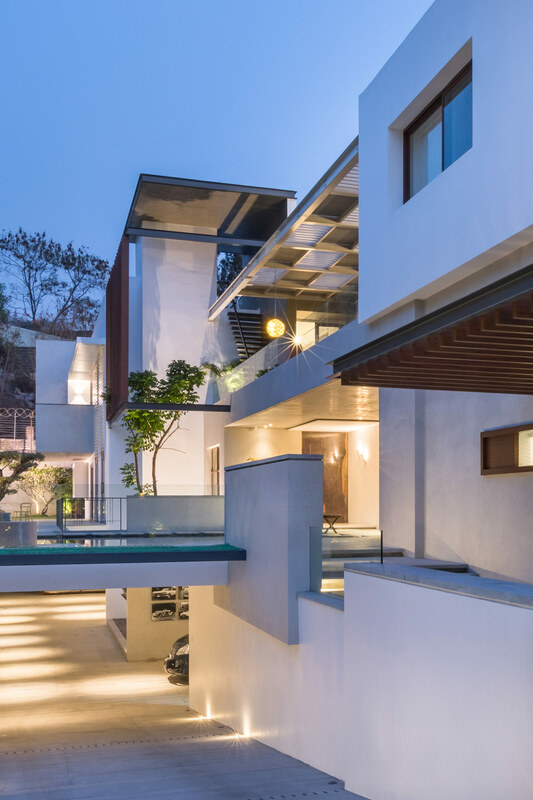 The projection wall can be viewed from various points in the house, including a bridge that connects both the houses. 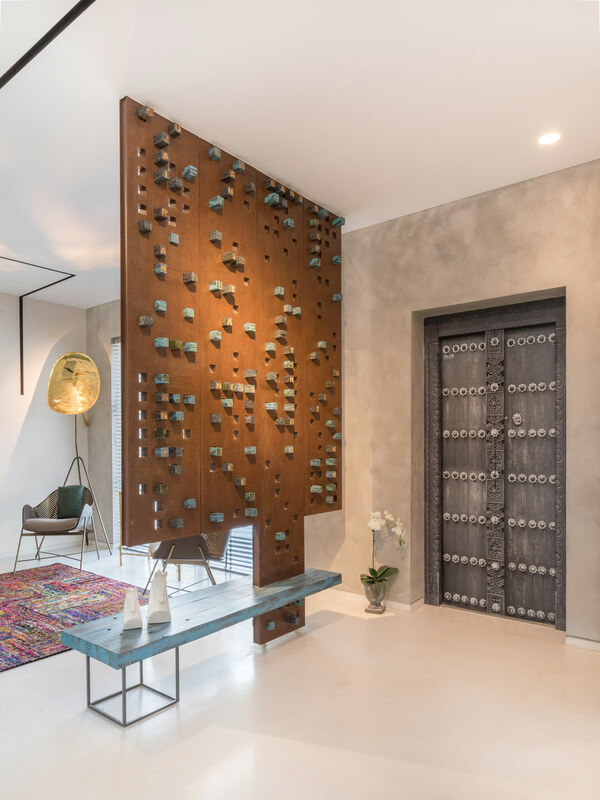 Beautiful bespoke pieces fill the home with a rustic meets luxury aesthetic. 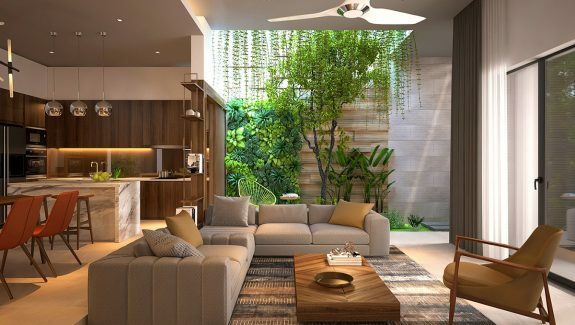 Neutral backdrops fill the spacious interiors, which bask in sunlight. The neutral palette is uplifted with colourful home accessories, like bright blue and green scatter cushions in the living room. 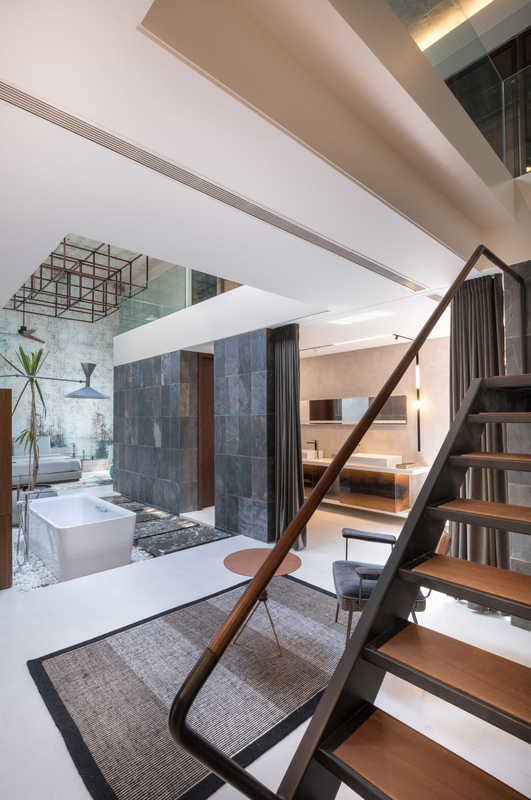 Stunning wooden pendant lights descend from a double height ceiling. A unique fan cools the air from an architectural support column. Unique nesting coffee tables bring in an eclectic vibe, and work perfectly with a patchwork concept rug. 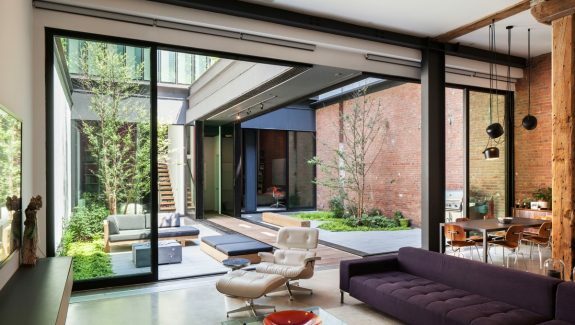 A modern accent chair is framed by a beautiful tree in the courtyard. 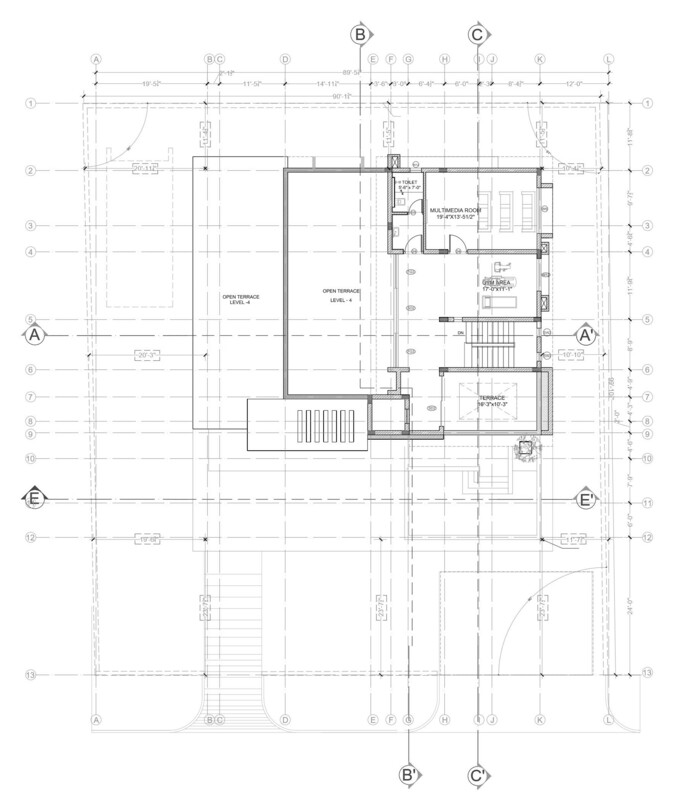 Informal living and dining areas and a guest bedroom fill the rest of the ground floor. Upstairs, identical double height master bedrooms and bathrooms are situated right next to each other. 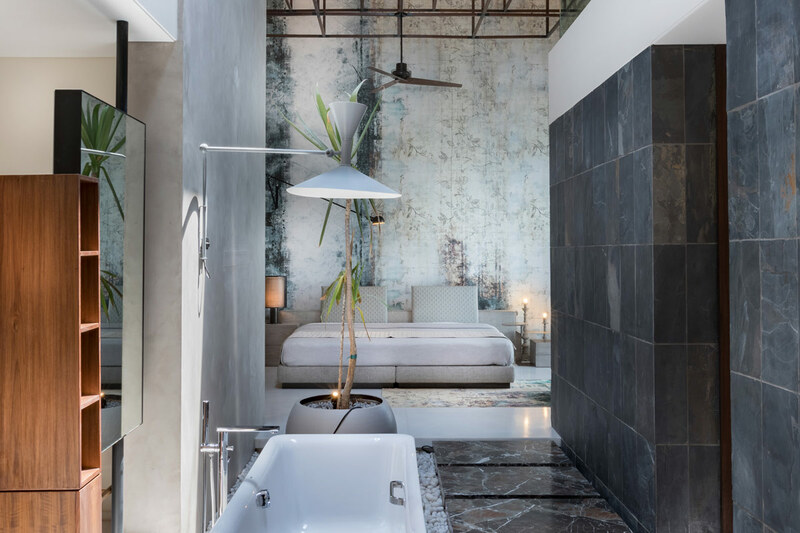 A swing arm wall lamp illuminates the bathtub, which stands on a bed of white pebbles. Double vanities are located behind a partially dividing wall. 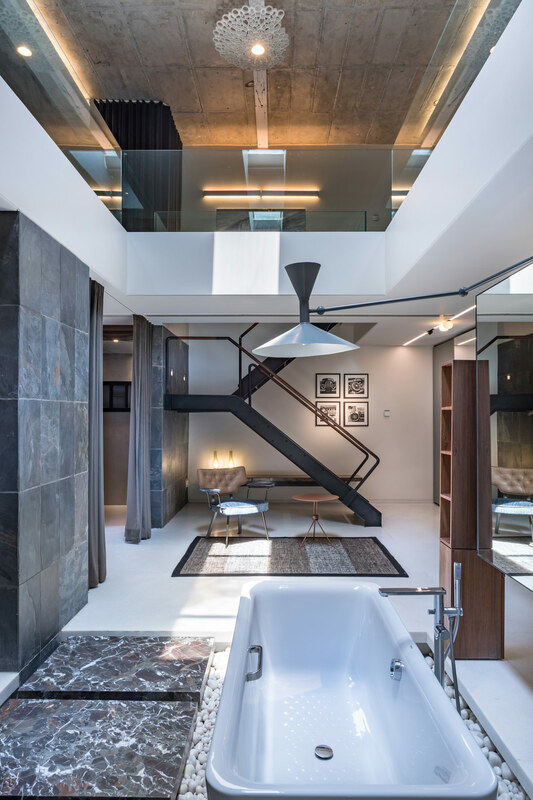 A motorised sun roof can be opened above the tub. The bathing area is open plan to the bed. 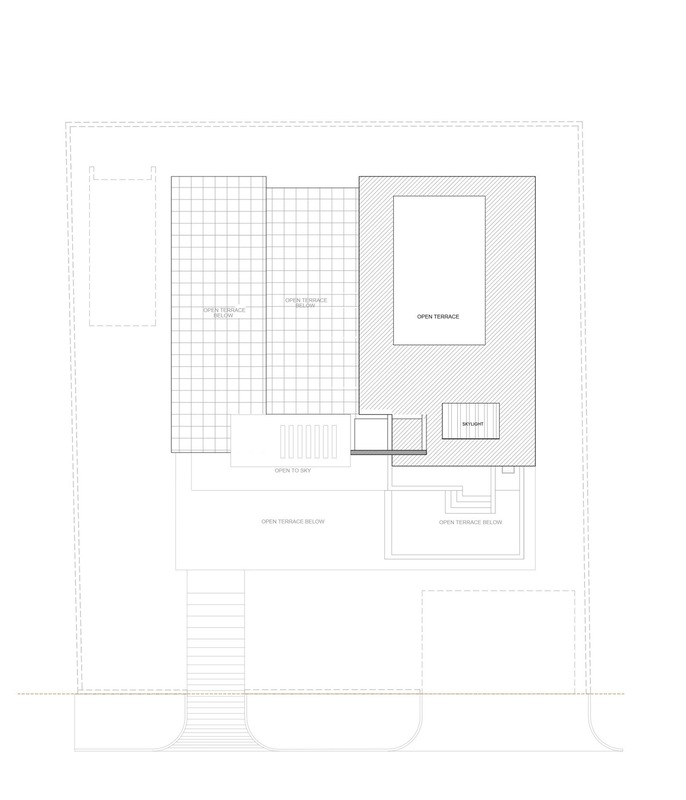 There is also a double story closet space in the master suite, to facilitate a progressive wardrobe. 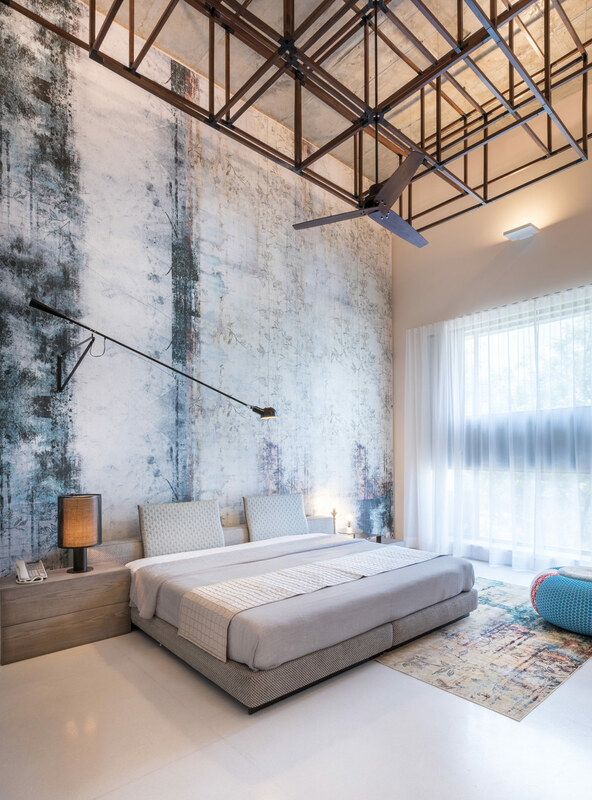 Cool distressed walls and metal framework create an industrial style bedroom. A Flos Mod 265 style lamp extends over the crisp modern bed. Original is available here. 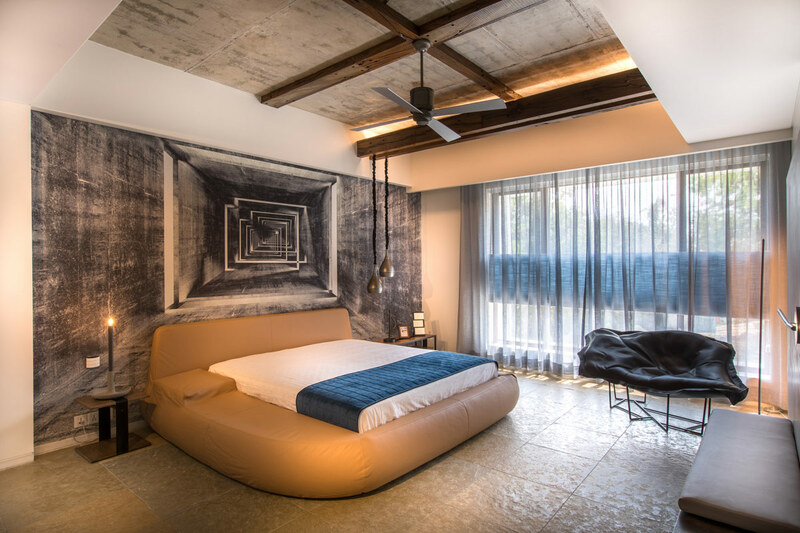 A duo of bedroom pendant lights hang beside a curvaceous bed inside this suite. 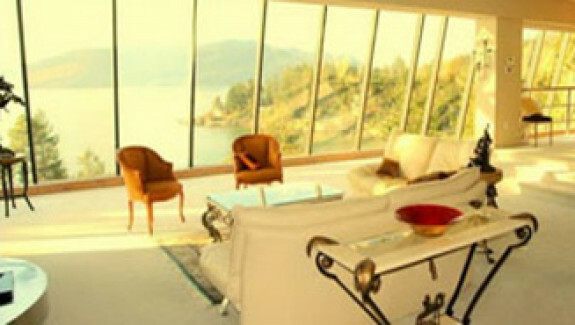 A modern lounge chair fills the window. The daughters room sits across from the master bedroom suites, with a small informal seating area in between. Colourful poufs and a teepee make playful decor. The bed features a study area beneath. See more ideas for kids’ beds. 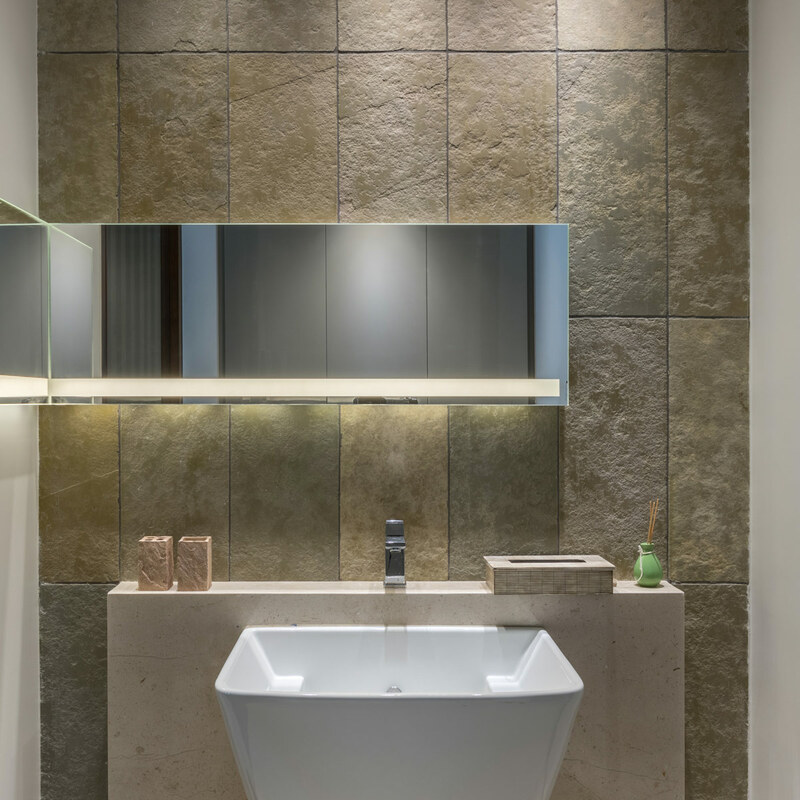 Stone tiles texture the powder room. 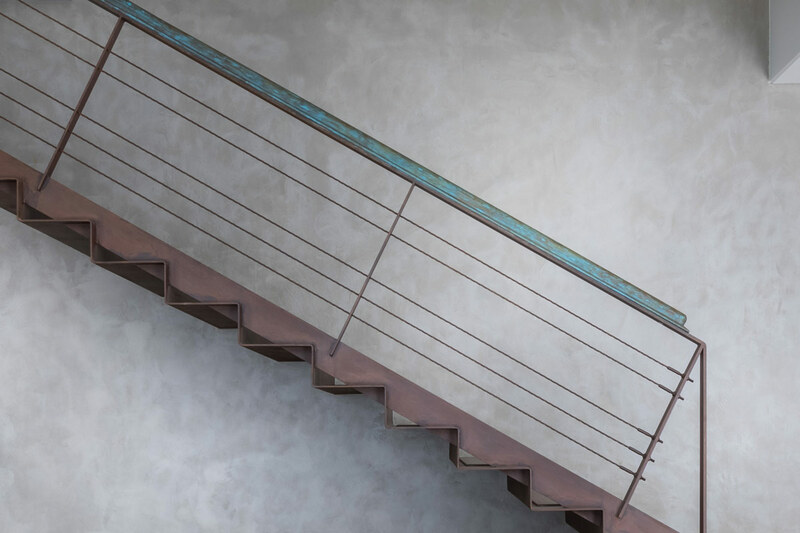 The staircase design follows the industrial trend. 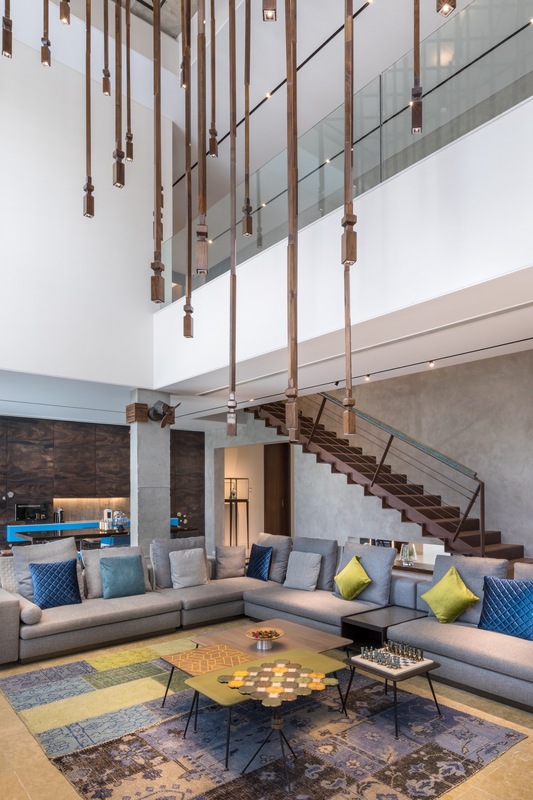 The bridge walkway that connects the first floors is furnished with inviting soft sofas, which make a sociable evening tea spot for members of the extended family. 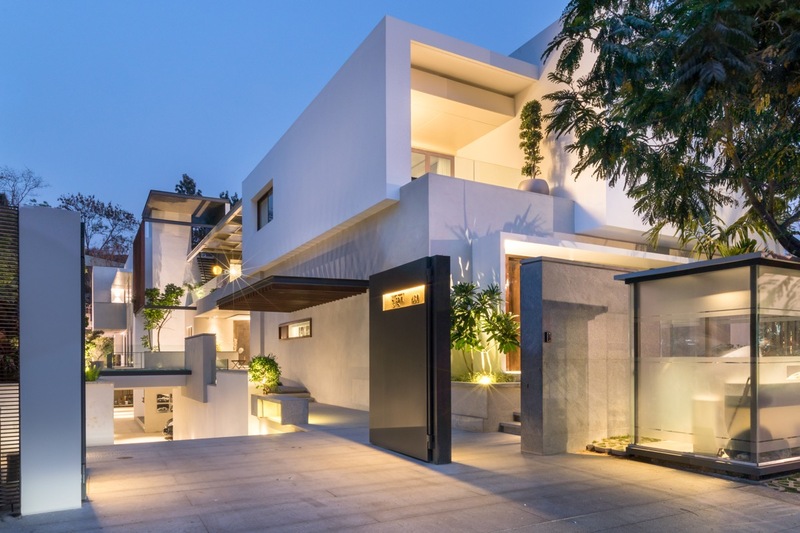 Exterior lighting keeps the volumes connected by night. 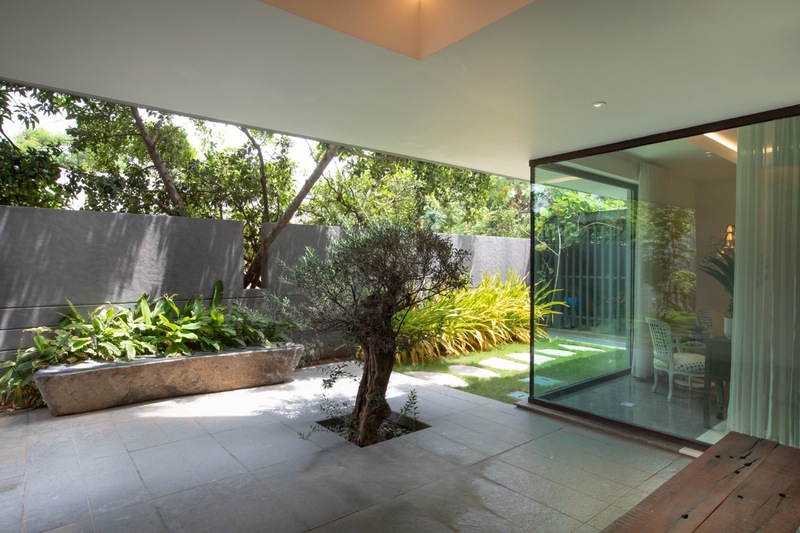 Potted plants colour the white concrete exterior space.